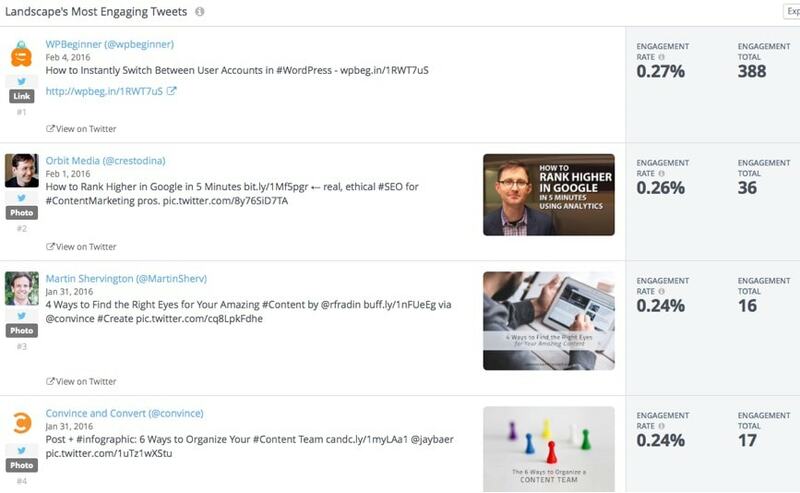 Are we tracking everything you should be tracking with social media analytics tools? 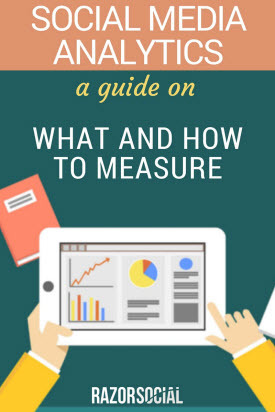 Do you know what you should be measuring and which metrics will give you the social data that matters – one that will help you make impactful marketing decisions? In this article, we outline what you need to be monitoring and suggest a range of tools for social media analysis and reporting. Download a summary of what social media analytics you need to keep track of and a summary table of tools to use. Bonus: We outline what tools we use to keep track of social media. 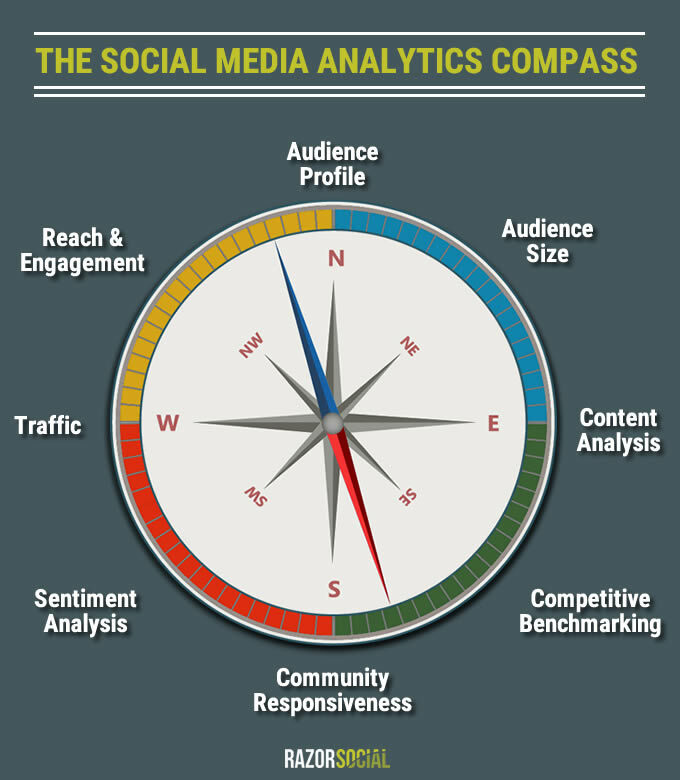 The compass includes the most essential areas to monitor for your social media channels. It’s impossible to monitor everything on all channels simultaneously, so you’ll need to determine what areas are important for your business and find a tool to provide relevant reports. So take a look at the compass, decide what’s important for your business to monitor and analyze, and identify the right tool to provide the relevant reports. First, let’s look at each section of the social media analysis compass (Note: you will need to differentiate between paid and unpaid). Does the size of your audience matter? Yes, of course it does….if you are building a relevant audience (see audience profile). You need to continuously build your audience. Your audience typically grows gradually unless you use tools or paid advertisement to grow. There is nothing wrong in investing in audience growth tactics if you have a process of converting that audience (see our PRISM funnel). Don’t forget to compare your weekly audience growth vs. your competitors. Also, keep track of the ‘unfollows’ where possible. As you grow your audience, making sure that you have the right audience profile will be a worthy time investment. For example, Twitter allows you to run a report to see what types of people (entrepreneurs, marketers, etc.) are part of your profile. On Facebook, you can set up an ad (you don’t have to run it) targeted to your Facebook fans and then change the targeting options to work out the profile of your audience. For example, add an interest and see how many of your fans have that interest. With a bit of smart thinking, you can perform this analysis across other platforms. You can use different tools or go for a more traditional approach and conduct audience surveys. Monitor your social reach to see how much of your audience pays attention to your content but don’t respond to it. Lack of response doesn’t necessarily mean they are not interested and they won’t buy from you. Engagement is also important to monitor because you expect that some of your audience will engage with your content. If no one is engaging with your content you have either the wrong content or the wrong audience! Lurkers – People that monitor what you share but don’t interact. This is usually the majority of your audience. Influencers – These are people that have access to a larger audience and have the potential of influencing this audience. Engagers – These are people that are more active in your community and you’ll start recognizing some of the names. Typically you will want to generate traffic back to your website from content you share and you’ll need to measure the impact of that traffic. For some companies traffic itself is enough. For example, if you are a media site you get paid for advertisements and more traffic means more money! For the rest of us, it’s crucial to generate leads and sales from the traffic we generate. Creating and sharing content is an expensive task. On a regular basis, you need to analyze your content to see what’s working/not working. Are videos, pictures or text updates working best? Do you have the right mix of content? Are you getting engagement on your questions? What changes have happened on the platforms that mean you need to change? (e.g. changes to profile images). You’ll need to monitor this on an ongoing basis. If you’re not responsive to your community they’ll stop interacting so it’s important to measure this, especially if you are using social media as a customer service channel. The response rates on social media are going to be equally important as those for email support requests. We should all learn from our competitors as they are probably learning from us! Compare your content to your competitors by monitoring important metrics, including their engagement stats, audience profile, audience size growth, etc. This active monitoring will give you ideas. Things to learn from and things to avoid! This is where you analyze positive, negative, or neutral mentions of your brand, product or service. 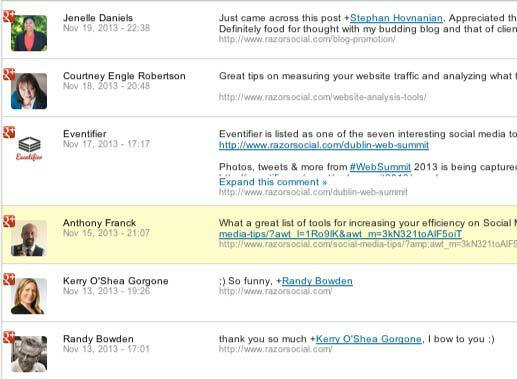 A social media monitoring tool like Brand24 will measure and report on the sentiment of your social mentions. Sentiment analysis tools are not 100% reliable but they can give you a good indicator when there’s a problem. When you are going through all your analytics you’ll need to start splitting out paid and unpaid media. All social media channels will require some paid media over time but this will affect your statistics. Creating a campaign to sell a specific product or service on your website needs a special mention. If you want to track sales from various channels, shared in various ways (e.g. post, ad, pinned post, etc. ), you’ll need to use unique tracking links. For example, I ran a conference with Mark Schaefer on Content Marketing in Dublin and we wanted to see where the sales are coming from. This is handled through a combination of setting up goals in Google Analytics and setting up UTM tracking, which adds additional information to the links you share so they can be tracked in Google Analytics. This level of tracking means you can go to the campaign section of Google Analytics and track exactly where your traffic comes from. What type of tools can you use? To track all important social media metrics, you may need to use different types of social media analytics tools. There are some great analytics tools provided by each of the platforms. For example, Twitter analytics or Facebook Insights. These social analytics tools have evolved over the years and provide some really useful functionality. Your starting point should be platform analytics because they are free and you are getting analytics straight from the horse’s mouth! There is a wide variety of social media management providers that provide free social media analysis as part of their solution. As the tools continue to mature, the social analytics get better! Check out tools such as Agorapulse or SproutSocial that provide very good analytics as part of their platforms. These are social media measurement tools that only provide social media analytics functionality. As their entire focus is analytics, you can find some great functionality as part of these platforms. The only thing to consider is that they are accessing platform analytics so their analytics can be only as good as the data provided by the platform! Here are some of the best social media analytics tools available. Rival IQ is a social media competitive analysis tool. You create one or more landscapes of competitors or clients and track their performance across both social media and the web. Pricing starts at $199 for 10 tracked companies, social media and SEO benchmarking included. For $349 this goes up to 15 tracked companies with additional integrations with Facebook Insights, Instagram Insights, Facebook Ads, LinkedIn Business Pages and Google Analytics. You connect your social profiles on Rival IQ and also add on any competitors you want to track. You can group companies into different landscapes (e.g. partner, competitor etc). You can create reports based on all this information. I have set up a weekly report from Rival IQ, which gives detailed information on our performance across channels and against competitors. The SEO section provides some basic information related to SEO. While this is certainly not a replacement for an SEO tool, it does provide you with some valuable, high-level information. This is a very intuitive platform with good social media analytics. 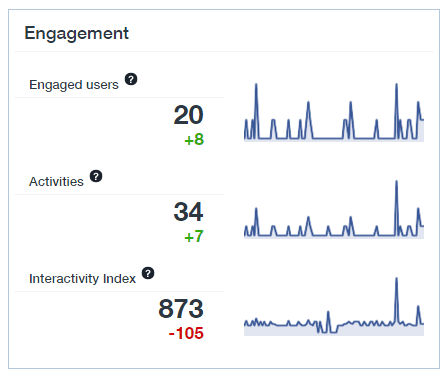 I’d like to see integration with Google Analytics as it would also be great to see the traffic generated and results achieved from your social media interactions. I’d also like to see more detailed SEO analytics, for example, being able to drill down on the most popular external links from competitors. This is a nice-to-have feature as opposed to an essential feature! A very useful platform well worth considering. Agorapulse is my tool of choice for managing all my social media profiles and they provide a good social media analysis option. You gte free social meida analytics as part of your subscription for managing social media. Just use the product as normal for managing your social profiles and you’ll automatically get nicely formatted reports that can be exported into Powerpoint format. You can view reports on a global level or drill down for each particular post. Considering that you get social media management and analytics all in one platform it’s very appealing! Google Analytics is a very comprehensive web analytics tool that most of us are familiar with to some degree, but it also provides some analytics that we quite often overlook and don’t spend enough time on! Track traffic from social platforms – You can drill down by referrer and look at the traffic generated from each of the social platforms. If you use a custom URL, you can track traffic generated from a specific link you shared. Isolate traffic using a segment – If you want to drill down on traffic for a particular channel, you can create a segment and view information just related to that channel. Social media dashboard – Create a graphical dashboard that shows a summary of your social media activity and the results of traffic generated. View real-time traffic – When you share out content on social media, you can view your website traffic in real-time. While you’re not going to do this all the time, you may have an important campaign that you want to track more closely in the early stages, and monitoring the real-time statistics can be useful. Create your goals – If you want to track conversions across social channels then a good way to do this is to set up a goal. For example, I have set up a goal for e-mail subscribers, so that when someone new signs-up, we can see which channel the subscriber came from. Custom Links – If you want to track the traffic that is generated for specific links, you can use Google URL Builder to create a custom link and then track activity on this link in Google Analytics (see How to track links shared on social media). Under the acquisition -> channels section of Google Analytics, you’ll be able to see traffic from each social channel and conversion of that traffic. If you want to set up an analytics dashboard, here’s one provided by Koozai. In the Acquisition > Social section, there are other social media analytics worth considering. For example, in the Data Hub section you can view the conversations related to your content that happened on various social channels. As well as tracking the activity on social media channels, you also need to track what happens when the traffic comes back to your website. Google Analytics is a useful tool for this. Zuum is a social media analysis tool used for benchmarking performance against competitors, finding the most engaging content. and identifying key influencers. Pricing starts at $119 per month. Influencer report showing the most influential users, which can be sorted by likes, engagement, shares etc. Set up daily, weekly or monthly email reports. When you login, the menu on the left allows you to select the social media channel and the area you want to view the analytics for. 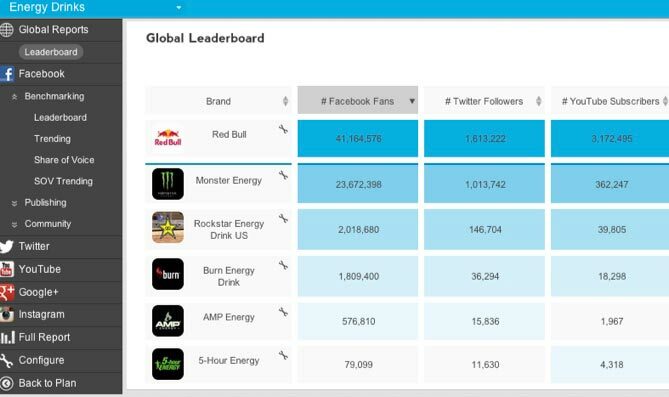 The initial screen shows a dashboard with fan/follower count for each competitor across all supported channels. Benchmarking – See how your brand is doing in relation to your competitors – fans, engagement, share of voice, trending content, etc. Here’s an example of the share of voice section. Publishing – What content is working, when it is working, what is getting the most likes/comments/shares? Here is an example of Twitter posting volume. The larger circles indicate when most activity occurred. This is a view for a particular brand but you can also view overall stats to show you and your competitors all on the same chart. 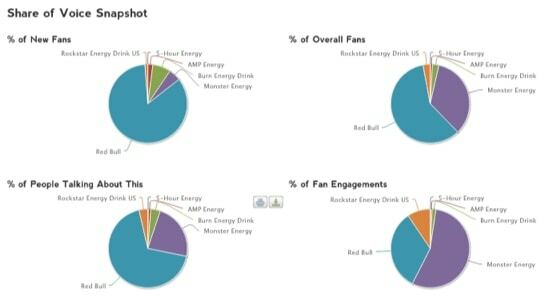 Community – This shows you the most engaging content shared by fans, the key influencers, what the community is talking about, the content fans are posting, etc. Zuum provides very good social media analytics that allow you to figure out what is working/not working on your accounts. Good, detailed analytics that is very easy to use. SoTrender is a social media analytics platform for all major networks, including Facebook, YouTube, Instagram and Twitter. As well as providing the analytics, it gives you recommendations on how to resolve some of the issues, which is useful. Pricing starts at $50 per month and for this amount you can track 2 brands. There’s a free 14 day trial available so you can try out the tool before committing. 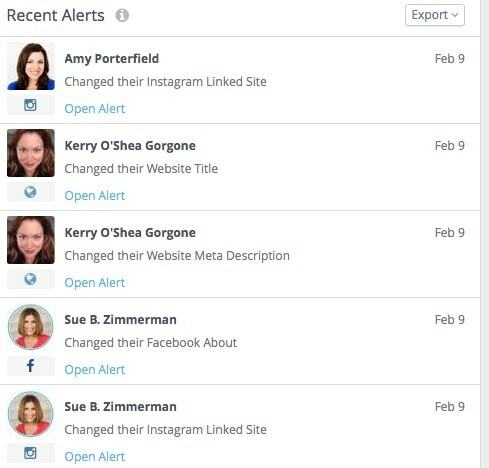 You connect your relevant social media accounts to your SoTrender account and allow it a few hours to gather data. Then, you can start to look at your social media analytics in the form of charts and graphs. And here, the days of the week on which we get the most engagement. These can all be accessed in the left-hand menu on the page. 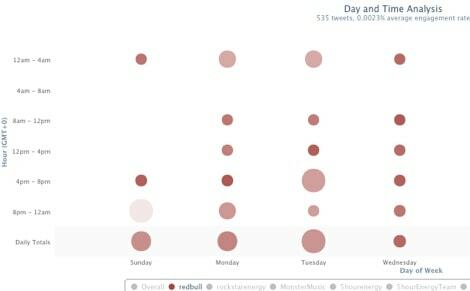 Which days of the week are your Facebook fans the most engaged? SoTrender also offers users tips to improve their social media accounts, an analysis of the types of posts you share, and a summary of your fans’ demographics. If you want a way to look at your social media analytics in a way that is nicely presented and accessible, SoTrender is a good, affordable option. It may not be as high performance a some, but it will give you a new perspective on your social media stats and help you to improve your performance and engagement. Quintly provides analytics for Facebook, Instagram, YouTube, LinkedIn, Pinterest and Twitter. The information is laid out in customizable dashboards where you can add widgets for data or stats you want to monitor. A list of standard widgets are provided. The pricing starts at $100 per month and includes analytics for 5 social profiles (each account/page is a profile). Further options are $255 for 15 profiles and $480 for 40 social profiles. When you add your social profiles, you are presented with a customizable dashboard with widgets containing graphs/data. You can also set up multiple dashboards. Here is an example of the graphs. A nice, easy user interface is provided by Quintly and I particularly like the dashboard approach where you can customize your own widgets. It comes in at an attractive starting price for your social media analytics. As your social media presence grows, you will need to consider investing in some 3rd-party analytics tools. Ideally, you want a cross-platform tool with competitive analysis included. The selection of some of the best social media analytics tools we have covered gives you some good options. What is your experience with social media analysis tools? What works best for you?